All transactions are safe and secure with a reliable history in online purchasing behind each of our associates. Buy the It All Started with a Chair t-shirt to own Juno clothing and merchandise. This Ellen Page Juno tee shirt celebrates the main character's opening line from the movie, "It all started with a chair." What started with a chair you ask? Let's just say that the chair acted as the stage for Paulie Bleeker and Juno MacGuff's tangle with intimacy, a tangle that ended with Juno pregnant. 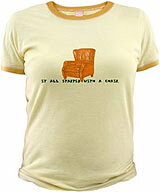 The front of this ringer T displays a rendering of the infamous chair, along with the Juno MacGuff quote from the Academy Award nominated film. Ellen Page also received a Best Actress nomination. In addition to the It All Started with a Chair tee above, browse the Juno Clothing Gallery for more apparel like men's and women's clothes, kids shirts or hoodies.